Recipes Cooking: Food Bloggers Unplugged! Theres a new tag in town, its Food Bloggers Unplugged which has been started by Susan from A Little Bit of Heaven on a Plate and I have been tagged by Karen at Lavender and Lovage. Now I really found this difficult as I dont have one book which I use all the time, there are quite a few which are greasy and splattered! Anyway, I decided to pick out three and tell you about them. 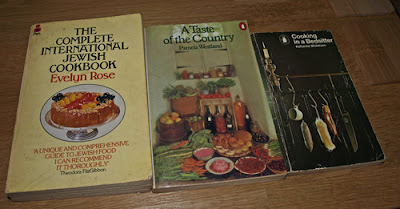 The complete International Jewish Cookbook by Evelyn Rose was a book I bought in 1978 (I noticed that I had written my name and the date on the inside title page) and cooked from for many years, there are some fabulous recipes in there and I used to be able to live for a week from a boiling fowl bought from the butchers, making it into all sorts of different dishes inpsired by Ms Rose. Again this is difficult, I have quite a few foodie memories, but not sure that I could pick one out as the best. However, the first time I went to another country it was on a family camping holiday to the South of France, it was a huge adventure and for a Scottish girl from a small country village in the early 1970s, I was very impressed by the bounty of the markets and particularly the fresh peaches, which we washed in the fountain by the market square and ate there and then. Id never tasted peaches so ripe and sweet. Another Food Bloggers table you would like to eat at? Id love to go to a dinner with Karen from Lavender and Lovage, Jac from Tinned Tomatoes, Dom from Belleau Kitchen, Fiona from London Unattached , Susan from A little bit of Heaven on a Plate and Kate from Turquoise Lemons. So Ill either have to tour round each one or they will all have to come to me. You see, for me, its all about the people not the food, a nice bowl of soup and some bread and cheese with like-minded friends would be fabulous. Id love a Magimix food processor. My food processor just wont die so I dont feel I can justify getting one. The one I have is a Moulinex which I bought in 1980 and is very basic, but the motor in it must be solid state! Im coming to you for dinner, what is your signature dish? It would have to be Beef in Barolo wine, Ive never actually used a bottle of Barolo, just a nice bottle of tannic red does the job. Its an ace recipe because all the work is done before hand, so you can spend time with your guests. Im not sure I have one...I try not to feel guilty about food, it takes away the pleasure.